Prepare a box of elbow macaroni and cheese as directed. Pour macaroni into an 8 x 4-inch loaf pan, cover and refrigerate until firm, at least 4 hours or overnight. Right before you plan to take the macaroni out of the fridge, place flour, beaten eggs and breadcrumbs in three separate, shallow bowls. Pour vegetable oil into a deep, large pot to about a 3/4-inch depth. Heat over medium-high heat, careful not to let it get smoky. Place a paper towel-lined tray near pot of oil. Remove macaroni from refrigerator and from loaf pan. Chop into 1 x 1 1/2-inch rectangles. Coat each rectangle with flour, then egg, then breadcrumbs. Using a slotted spoon, place as many bites in the hot oil as you can without crowding them. Deeply brown them on one side, then the other, then remove with a slotted spoon and place on paper towels. Serve warm. This is the kind of recipe that hurts, but hurts so good. It’s the kind of thing you make when you want to wow your guests with your creativity. The other motive: make sure they eat so many that you don’t have to pick up the slack. But if you have to, that’s fine. Sometimes there is never too much of a good thing! 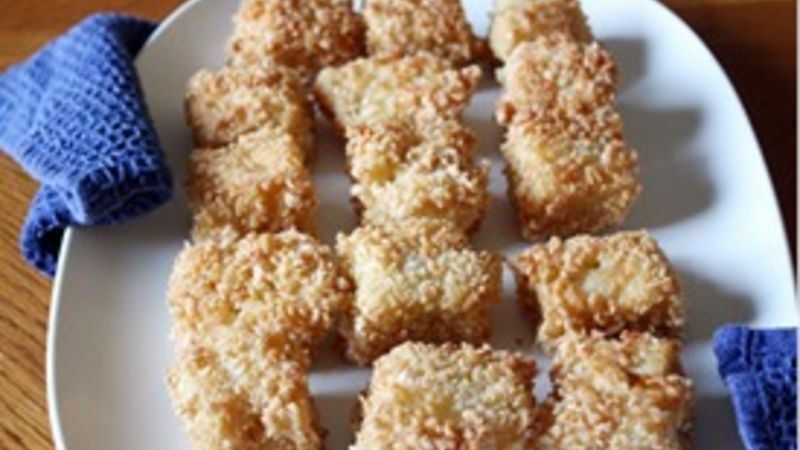 This recipe for Deep Fried Mac n’ Cheese reminds me a lot of arancini – delicious Italian breaded rice balls filled with cheese or meat sauce and other yummy ingredients. But this lowbrow recipe is much easier to make in your kitchen, and uses ingredients you probably have on hand already. I made my version with white cheddar elbow macaroni and crispy Panko breadcrumbs, but feel free to mix it up with sharp cheddar macaroni, regular breadcrumbs, herbs, spices – whatever you like! You can use a store-bought variety of mac and cheese or make it from scratch. Always remember to be safe when frying things in hot oil – wear long sleeves and never, ever put your face near the pot. Also, use a slotted spoon to place the bites into the oil and to remove them. Trust me – freshly oiled food is HOT! After you’ve placed your bites in the oil and let them deeply brown on both sides, remove them and place them on the paper towels. Voila! Gooey, cheesy, deep-fried deliciousness at your fingertips.